Firstly I’ll start by mentioning that Annie’s was the first ever place I blogged about back in early 2014. The venue and food were both so good that I just had to let people know about this amazing place. So now here is my updated version from my recent visit last Friday, just to give people a guide on how the place is doing and what burgers are on offer. 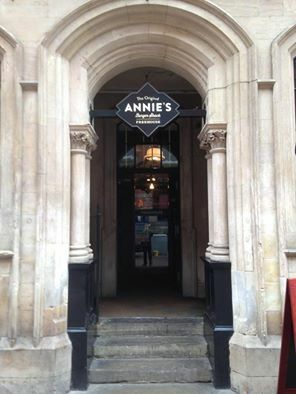 Located in the heart of the Lace Market, Nottingham, Annie’s Burger Shack quickly became more popular than ever when they moved to their current location at 5 Broadway back in January 2014. 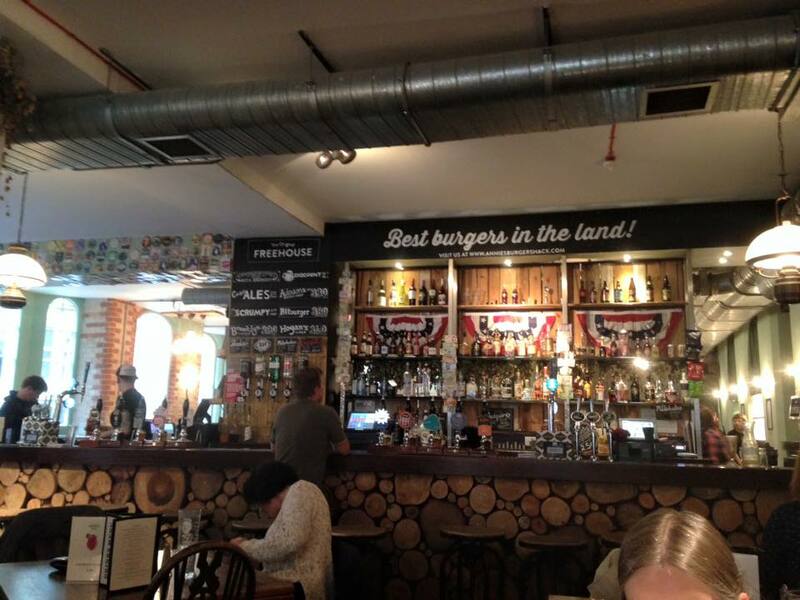 Formally part of the Navigation pub In Nottingham city centre Annie’s burgers became a huge success, so much so that they had to move to their current and larger venue just to cope with the demand for their burgers. Back when I wrote my first review Annie’s burgers were the best I had ever tasted and still are to this day. Nowhere else have I seen such a diverse range of burgers and finely chosen ingredients and toppings, not to mention their commitment to providing a paradise for both vegetarians and vegans as each and every one of their burgers can be served as vegan or vegetarian. Upon entering we were seating immediately. However we did go in the afternoon so be advised that booking in advance is preferable, especially if you are going at the weekend or as part of a larger group, although you can wait at the bar or even in the Ocean State Tavern downstairs in the evenings where you can wait for a table to become available. It still has that same great atmosphere and the decor is fantastic, with traditional wooden floors and wooden tables that vary in size for two people to family and larger groups. The wood cladding and exposed brick work gives this venue a really realistic feeling. It is expertly kitted out and sets the tone for what is an excellent burger bar. The oak clad bar is a real centre piece and is set in the middle of the restaurant and offers a wide range of spirits and beers from both the UK and America. The venue is finished off with traditional American sports memorabilia to give it a really classic diner feel. They make authentic Rhode Island style burgers. Their meaty burgers are a delicate mix of prime beef 85% and pork 15%. Even better is the fact that all of their mince comes from farms in the East Midlands. 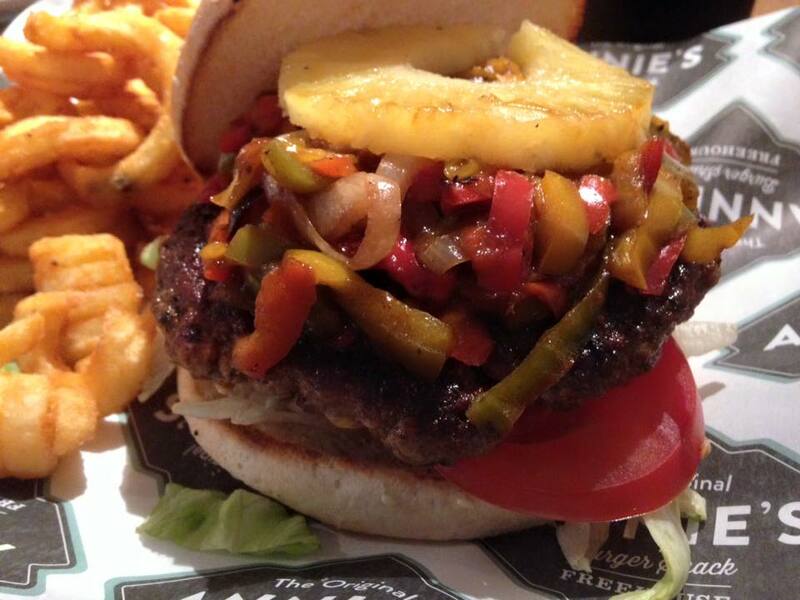 After the usual headache of deciding what to have, as there is just so much choice, I went for the Caribbean burger an authentic jerk spiced chicken or beef burger, topped with Caribbean jerk sauce, onions, peppers and a fresh grilled pineapple ring. The burger itself was a good size and held together well as a patty. It was perfectly cooked and was slightly blackened on the outside yet succulent and juicy on the inside, with the paprika adding extra taste and smokiness to the burger. The peppers and onions added a nice range of colours to make it more vibrant and they were all bursting with juicy flavours. The burger was spiced well with the jerk seasoning and this also had a sweet hint to it. The chillies from the seasoning added a nice burning and warmness to the burger without it overpowering the other components of the dish and for me that’s what a great dish should have as you can taste each and every one of the different flavours in the dish. The burger arrived in a sesame seed bun, which was fresh and lightly toasted to keep it from getting soggy from the filling of the burger. You also get a choice of what side you want from; side salad, skinny fries, curly fries, homemade Cajun wedges, homemade salted wedges and for an extra pound you can add sweet potato fries or beer battered onion rings. I got the curly fries and these were perfectly cooked and lightly seasoned with salt. Not to mention the fact that you got a mountainous portion. Overall, it was just as amazing as every other time I had been, great quality burgers, superb toppings and a top class venue to top it off. The service was very friendly and attentive and everything seemed to run smoothly. If you still haven’t been here, make sure you visit as soon as possible, you are missing out! They have a burger for everyone from Spicy to sweet; from traditional cheese burgers to a traditional Sunday dinner burgers! 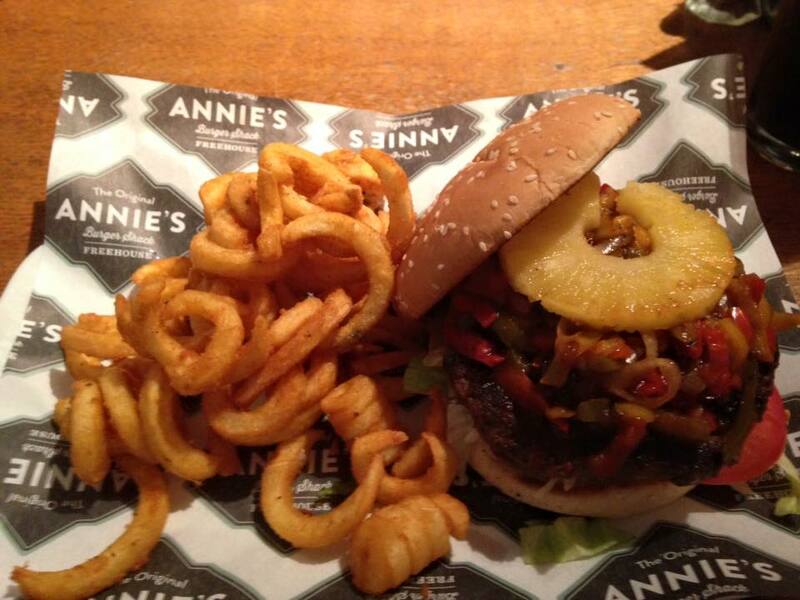 Location: Annie’s Burger Shack, 5 Broadway, Nottingham, NG1 1PR. Opening times: Monday to Thursday 12PM – 9:30PM, Friday and Saturday 12PM – 10:30PM, Sunday 12PM – 9:30PM.